The core of physicians, paramedics and other healthcare professionals who present materials in the classroom for paramedic students are essential to the success of each and every student, as well as the program. This section provides the necessary resources for instructors such as links to calendars, forms for compensation, student rosters, and soon to come, a library of presentation and lecture materials. Thank you for tackling one of the most difficult tasks in paramedicine: teaching in the field. Observing and providing feedback while a student performs a patient-care task, even though you could do it faster & better, is essential to student learning. For Class 45, we will be coaching a feedback method that can help field Paramedics & Instructors organize their approach. What is "Prepare to ADAPT"? 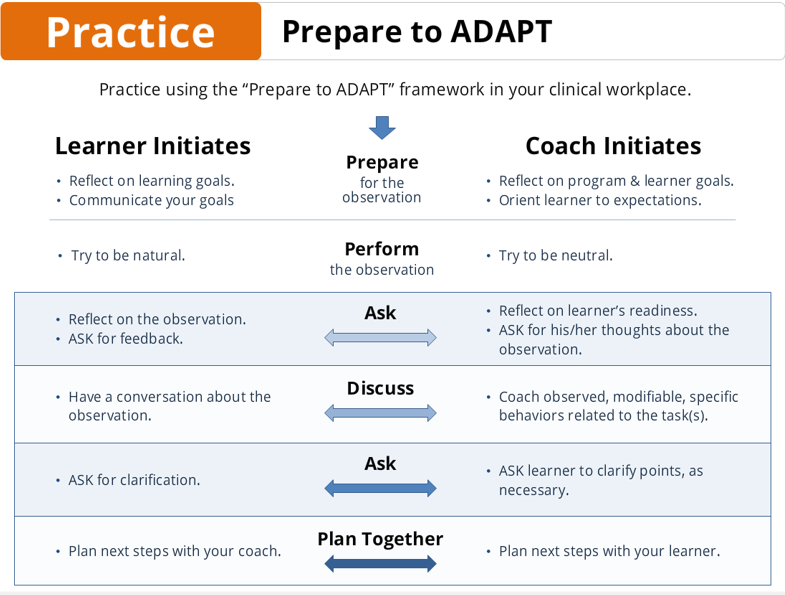 The Prepare to ADAPT (Ask-Discuss-Ask-Plan Together) feedback framework is an approach to asking for, receiving, and providing feedback in the clinical learning environment. The "Prepare to ADAPT" feedback framework is a theory-informed conversational approach to feedback based on the "Ask-Tell-Ask" discourse pattern that providers often follow with patients. Compensation is handled on a per diem basis. The appropriate forms are available in the classroom or PMT office. Forms should be submitted to PMT staff.